Greetings from Arcelas the n00b! If you are reading this right now, it means I have successfully posted it. Quest Line: Lose 59 lbs. Reduce sodas to once or twice a month on movie night. Start at weekly and reduce from there. myfitnesspal is my bestest friend! Continue bodyweight level 2 for 2-3 weeks of the challenge. Fight the boss during week 3 or 4. OK Rebels. Let's do this! Hi arcelas, welcome! Good luck with your challenge! PleasepleasepleasepleasepleasepleasepleasePLEASE tell me you're going to combine the magic tricks with the band's live performances as soon as you possibly can? And good luck to you with the challenges! Not that you'll need it. Echoing scalyfreak here! Magic + tunes would be amazing!! I'm really looking forward to following your progress! Keep us posted! It is my intention to do that. As a vocalist, my hands would be free to do some cool tricks while I'm singing. I hit 6000 steps yesterday without trying to. Due to this, I have amended my step goal to the AMA recommended 10k steps per day. Starting at 5k this week. Sun-Tue were lower but above 2500. I did my cooking on Monday this week. (holiday), but I made food for the whole week. No need to eat out at all this week. The idea is to go from "oh crap, I have to eat out because I did not prepare anything" to "Why, yes, I'd like to eat at a nice restaurant this weekend with you, my dear"
Tuesday I read the first section of RRTCM and Watched the video section. I practiced that section for 10 minutes. I have not yet practiced my singing this week. I haven't decided about rewards yet. Any suggestions? Trying to keep spending relativly low, so XP in the Epic quest system might be good for this 1st challenge anyway. 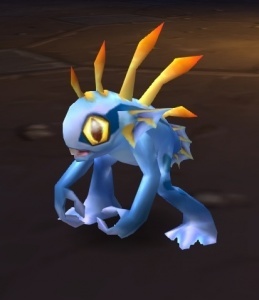 The question is.....what kind of murloc are we talking about becoming? Fel diseased murloc? 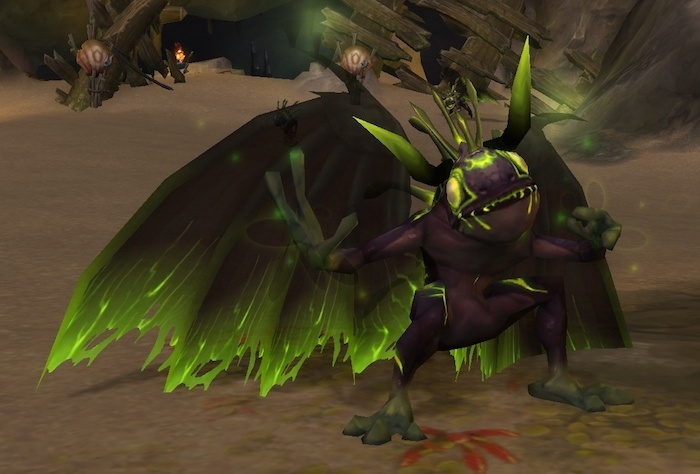 Why yes, they did make an Illidan Murloc in game. Wow, been a bit since I played. Murky was my last Murloc intro. Oh yes, many many more Murlocs abound in WoW. Though even I did a double take at the Illidan Murloc. I was like...oh. my. whut. Murky is a good Murloc. Hope the challenge goes well and I would totally dig watching a band where the lead singer did magic tricks. That would be awesome! Day 5 - 01/05-18 TGIF! Step goal for the day exceeded again. I walk around at my job (I am in Deskside Support), so I get quite a few steps in that way. In addition, I take several 3-5 minute breaks to just walk and stretch. In coming weeks I will probably need to go for actual walks after work. I forgot to bring my lunch with me today. Fortunately, I have nut bars from Costco, and I'm only working a part day. Worked on some sleights while watching SWAT (2017) with my dad. We have Thursday Movie/TV Show Night. I watched the intro videos and did lip drills. They tickle! I'm going out tonight with a lady friend I had a date with a couple weeks ago. We are going to a karaoke bar. Not sure if this qualifies as a second date or not. I'm not as nervous as I would have expected. Wish me luck! P.S. I started Nerd Fitness Coaching. I did movement assessments, and Jim plotted my nutrition for with me. I will post a more in-depth review after I've been doing the program for a while. Hit 7800 steps on Sunday! Shopping at Costco will do that. Set my new goal to 6667 steps. Watched the first three lessons and read the chapter in the book. Practiced for about 10-15 minutes. *Bonus* I learned to perform the LePaul Spread. I'll post a video of it this week. Starting the workout program created by Jim Bathurst today. Pretty excited! I had a family emergency, my 8-month-old nephew fell out of his high chair and drove his front tooth through the roof of his mouth. I spent yesterday helping my brother and his girlfriend clean up the house, figure out their insurance, and book a few appointments. I felt like I was running around like a maniac, but I did not get my 30 minutes of walking in, nor hit my step goal. I went to the movies with my lady friend. We saw Molly's Game. (Which is fantastic by the way. Highly recommended.) It was our fourth date, but we dropped the number from the front and added 'ing' to the end. Although I was walking around a large hospital yesterday, I did not hit my step goal. In fact, I barely got 50%. Delicious homemade meals are a go again. A lot of chicken and vegetables right now. Organic Normandy Blend from Costco is wonderful. Instead of grabbing a bite to eat from some narly fast-food joint before the movie last night, my lady friend and I bought ground beef and broccoli. We made hamburgers on the stove that were quite tasty. No vocal practice either yesterday. Tonight for sure: Lip rolls. put together two go bags for the gym. The plan is to keep one in the trunk in case I forget to bring my gear. Not even close. I've got to buckle down. I need a time budgeting program like YNAB for time. Looking good. Going into the third week of the challenge with $17.89 spent on dining out so far. Not to mention the added health benefit from making your own food. Practiced some basic moves yesterday during movie night. I have read/watched chapter one twice now, next comes solid practice time. I have not been practicing this week at all. I think I am going to download the practice audio and practice during my daily commute. My nephew is better. They decided to just leave him with the missing tooth. The good: I'm in the lovey-dovey teenage phase with my new girlfriend. We are awesome together! The bad: absolutely everything else. I haven't been to the gym since the 8th of January. I haven't hit my step goal or practiced any singing or magic. I was sick the past few days (including today), so no food got cooked. Fortunately, I have soup and a few microwave dinners left. I need to budget my time, the way I learned to budget my money. During the week, I sleep 8 hours a day and work 8 hours. This leaves 8 hours to do the rest of the things in my life. That is the time I need to budget better. Does anyone have any suggestions for this process? Any apps that help with this? I'm going to walk around my work during lunch today, as I am sick and not interested in food today. Being sick or injured does crazy things to anyone's routine. Don't beat yourself up over it. Do what you can, to the extent you can, and focus on getting better.The challenge is not going anywhere and as long as you get back to it when you can, no harm done. Hard to want to walk when you are coughing lungs out your back. I'm supposed to be at 8333 steps this week, but it feels impossible. I think I'm going to back off a bit on the speed of this challenge's difficulty curve. Didn't cook a darn thing, but I'm still well under my dining out limit for the month. Alright! Re-read the chapter and re-watched the videos. then practiced for over an hour yesterday. Feeling very comfortable with the move. No music yet this week as I am getting over a cold. How's it going @Arcelas the n00b? Feeling any better? How's it going [mention=49021]Arcelas the n00b[/mention]? Feeling any better? Loads. Being sick messed up my weekly routine as far as making food goes. I haven't been to the gym for a while, but I have done home workouts a few times. I'm going to my girlfriend's gym tomorrow for a water aerobics class. We both want to get in shape, but want to start low impact. On the other hand, my non-fitness goals are going great. I've been practicing my magic regularly, and even have a gig on the 9th of February. I have an audition on Saturday for the frontman of a rock band in Omaha, NE. Going to do my strength workout after work in 1.5 hours. Let's end the month and challenge strong! It's great that you both want to get in shape. Good luck with the audition! And the gig! This challenge has been strange. On one hand, I have gone days without completing one of my goals. On the other hand, I can show concrete evidence of progress along all four paths. Walking: have not hit my step goals every day, but have been consistently walking. Dining out costs: I am going to end the month under $100 for dining out! 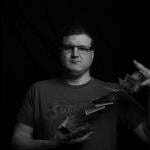 Magic: I have finished the 1st chapter of the Royal Road to Card Magic. I added 2 or 3 effects to my routine. Music/Singing: I have been practicing during my daily commute. I had an audition for a lead vocalist position, but it looks like they are going a different way. I starting to write lyrics again. Non-challenge items: reduced weight to 282 lbs. The lightest I've been in about 3 years. Clean bill of health from doctor. Got some new stuff planned for the next challenge, focusing more on Fitness. Stay tuned! Strange or not, you are making progress. I'm impressed, you are doing much better than I am. Are you staying with the Rebels for your next challenge? I'm not sure, considering increasing my squat and other lifts by a reasonable % is a considered goal for next challenge. I just looked over your challenge, and you are progressing fine. The unexpected is just that. We'll just power on through it.